A generation after the death of John Wesley, Methodism experienced its first significant decline. Meticulous in recording their numbers, British Methodists preachers gathering at the Liverpool Conference in 1820 were alarmed to note a net loss of 4,688 adherents in a single year. From their vantage point it was not at all clear that Methodism was successfully navigating the inevitable institutionalization of the movement and the passing of the generation of leaders that had participated in Methodism’s first flowering. The next three years, however, would witness a remarkable turnaround that would eventually lead to the tripling of the movement in numbers over the following eighty years (interrupted only by a denominational split in 1850). Mathematician John Hayward has chronicled the 19th Century growth of British Methodism and notes admiringly that the vast majority of it was due to new conversions as opposed to population growth. The preachers in conference in Liverpool developed the first-ever Methodist turnaround strategy. 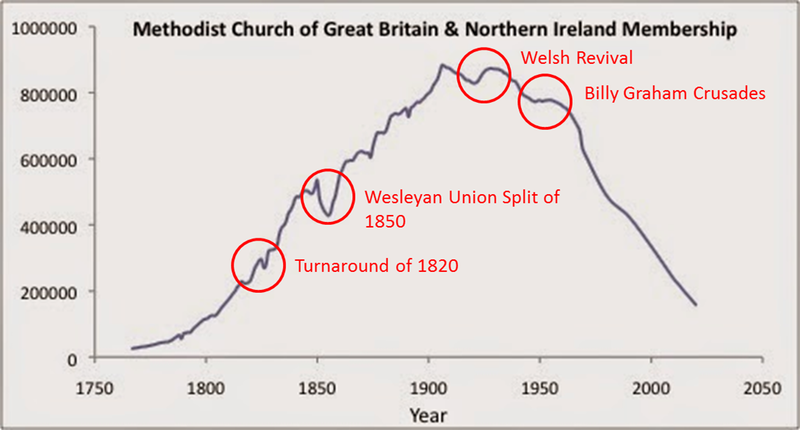 Although the overall growth in American Methodism during the Nineteenth Century is even more dramatic, the British example, combined with the detailed minutes we have from the Liverpool Conference, give us insight into a uniquely Methodist model of addressing and reversing decline. The first thing we can say about their approach is that other business was subjugated to the concern of charting a more fruitful course. Chronicler Valentine Ward, writing just a few years after the Liverpool Conference, calls the mood at the gathering a “strong sensation” for reversing the ebb. It was clear that the group equated loss of numbers with a failure of the mission that must be corrected. Numbers matter, especially when you are counting people. The preachers realized that any solution must begin with them: “We on this solemn occasion devote ourselves afresh to God and resolve in humble dependence on his grace to me more than ever attentive to Personal Religion and to the Christian instruction and government of our own families.” They vowed to eliminate any distraction from the work of saving souls and spiritually shepherding the flock. The pastors prayed for spiritual gifts that would allow them to minister more effectively. They recommitted to study while “taking care that whatever qualification we may acquire and use our ministry shall, by the Divine blessing, be always characterized by sound evangelical doctrine, by plainness of speech, and by a spirit of tender affection and burning zeal.” The solution would begin in the hearts of the leaders. The preachers committed to renewing their preaching. The content of their preaching would be refocused on the vital doctrines of the Christian faith. The method of their preaching would be evangelistic, experiential (practical), and zealous. They would strive for clarity and simplicity while making application of the grand doctrines of the faith to the various people listening. When visitors were present, they would pointedly and passionately offer an invitation to receive Christ. Their preaching would be orthodox, practical, and call for immediate response. Extension of the work was to be the job of every preacher. They were not only to tend their circuits, but they were to rebrand themselves as Home Missionaries and begin ministries in any place underserved by the Movement. Capable lay leaders of the more established circuits were to be employed in preaching in rural locations. New classes were to be started in neighborhoods as a strategy for involving new leaders and reaching new people. Prayer meetings, likewise, were to be held in homes of various neighborhoods as a sort of nursery to develop new societies and leaders. The Methodists decided to reclaim their roots as an insurgent and entrepreneurial spiritual movement. “Let us at least in every large town establish weekly meetings for the children of our friends according to our ancient custom and let us pay particular spiritual attention in public and private to the young people of our Societies and Congregations.” Wesley had insisted that each preacher be personally involved in the ministry of teaching children. In light of the decline recorded in 1820, the Liverpool Conference commissioned a new catechism to be used with young people. The training of the rising generation would no longer be neglected. The preachers recommitted to visiting the sick, the “careless”, and the lukewarm. Class leaders were to recommit to visiting the members in their care weekly and inquire personally about the spiritual state of each. This would free the preachers up to visit those who had gone AWOL. During pastoral visits, families were to be encouraged to practice private spiritual disciplines. The public spiritual disciplines of worship, Sabbath-keeping, and Holy Communion were to likewise be publicly encouraged. A re-commitment was made to “Wesley’s Instructions for Helpers” and the guidelines found in the “Large Minutes”, a collection of best practices developed under Wesley’s guidance. Even as they reconnected with their Wesleyan roots, they likewise committed to the “catholic spirit” and pledged to avoid small-minded arguments over theological minutiae. There was a “spirit of strife and debate” that had crept in and the 1820 conference was committed to driving this out. Administrative sloppiness was corrected, especially as it related to organizing the spiritual care of the people. There was a renewed effort to make meetings “interesting and appropriate to… the state of the people.” The need was recognized for high-quality, relevant, and practical instruction. At the subsequent conference in 1821 and 1822, the preachers revisited and reaffirmed the plan that had led to a numerical turnaround. They particularly commended the continued practice of prayer and fasting. The benefit of prayer meetings in homes was restated as was the value of encouraging members to meet in bands. Slightly smaller, more intimate, and more intense than the regular class meetings, the bands were aimed at accountability and intentionally encouraging spiritual progress. The decline of 1820 was a mere blip on the map because it was quickly, correctly, and aggressively addressed. Over time, however, decline becomes an ingrained pattern that is much more difficult to reverse. It would be difficult to conceive, however, a more faithful pattern of renewal than the one prescribed by the British Methodists in 1820. 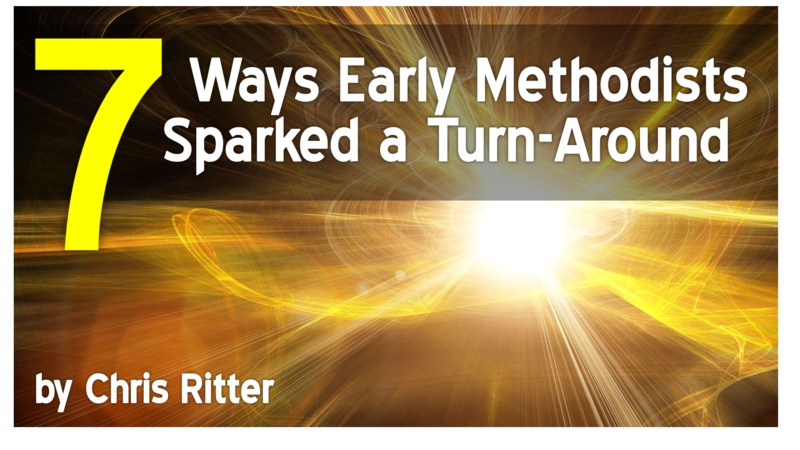 What would happen if Methodists today adopted these same seven strategies?